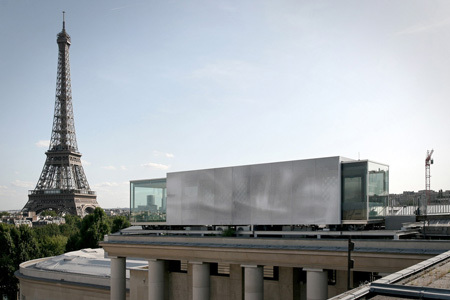 Parisian architect Pascal Grasso has installed a temporary, transportable restaurant on the roof of Le Palais de Tokyo museum in Paris. 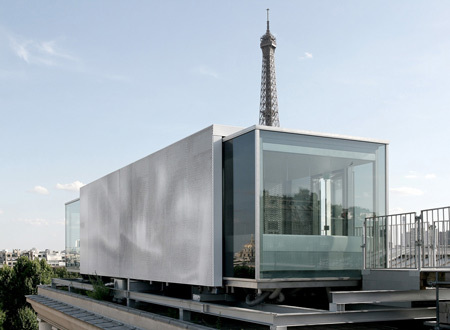 The structure features a dining room for twelve people with a panoramic view over the Seine and the Eiffel tower. 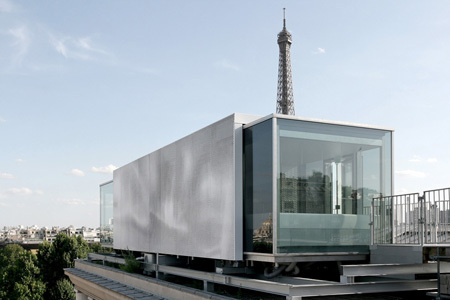 The restaurant comprises a glass cabin and a perforated metal screen covering the central cooking area. 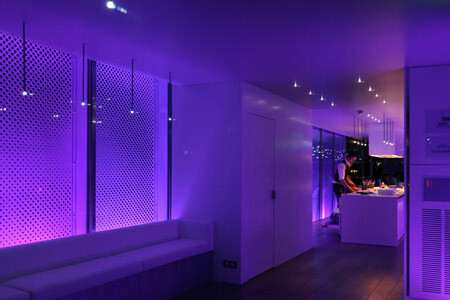 Coloured LED lighting is placed between the metal skin and the glass core. 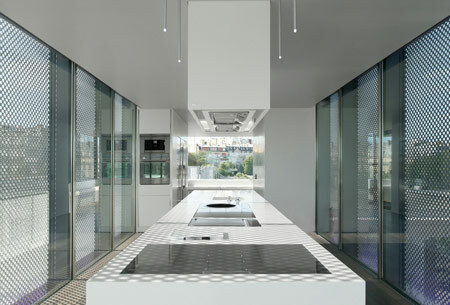 White Corian furniture populates the dining room. 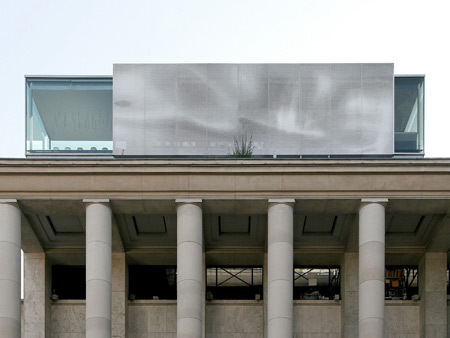 The 18 metre-long structure was part constructed in the Cherbourg boatyard in northern France and transported to Paris in two parts, where it was assembled on the roof of Le Palais de Tokyo. The restaurant takes its name, Nomiya, from a very small restaurant in Japan. Photos are by Nicolas Dorval-Bory. 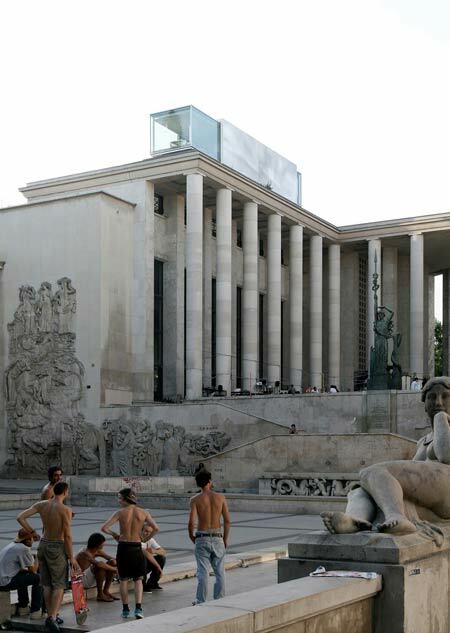 The art center ����Le Palais de Tokyo���� asked us to imagine a temporay piece on the roof of the building. 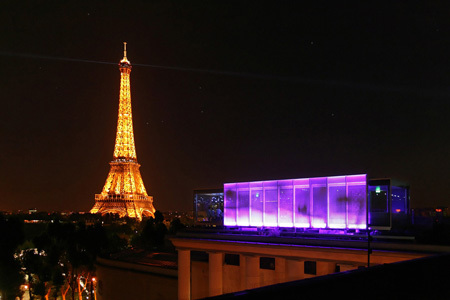 We designed a take-down and easily transportable module, which is a twelve seats dining room, with a panoramic view on Paris. Nomiya is the name of the very small restaurant in Japan. 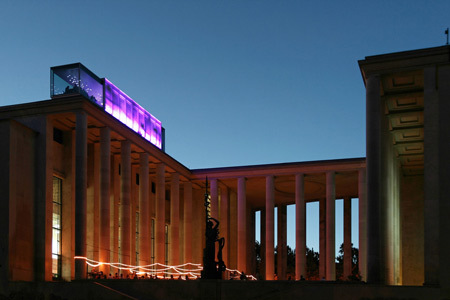 The structure is 18m long,�� 4m large, 3.50 m high and weights 22 tonnes. 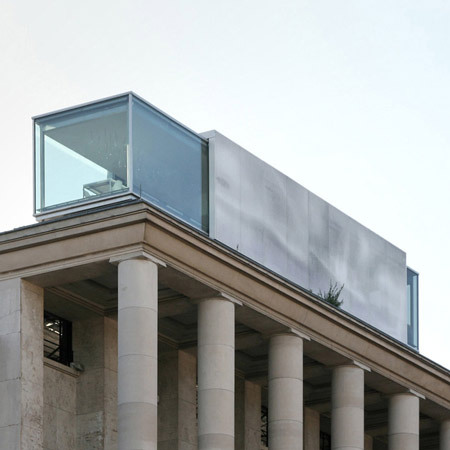 It has been constructed in the Cherbourg boatyard, in the North of France, and transported in two pieces by special trunks to Paris, and then set on the roof of the Museum. 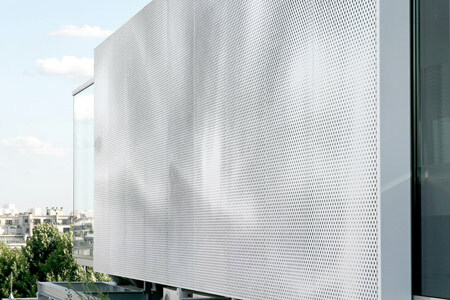 This construction is composed by a glass volume, covered by a metallic skin on its central part. 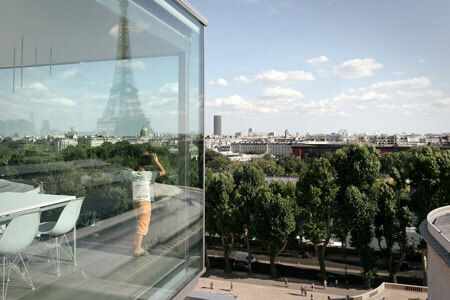 The dining area, entirely made of glass, is looking at the Seine and the Eiffel tower. 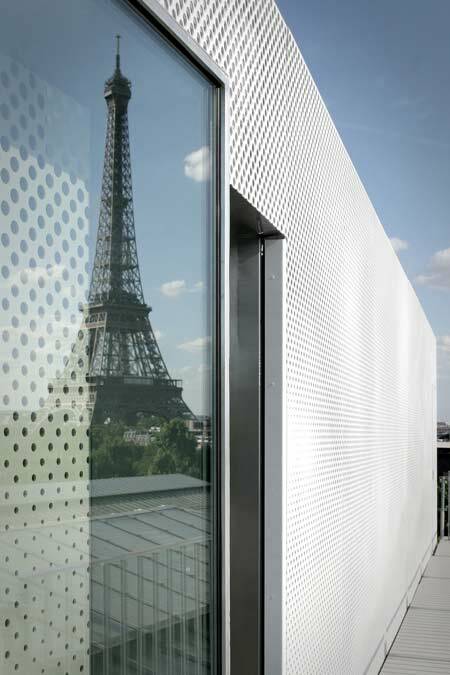 The central part (cooking aera) is covered by a punched made-to-measure sheet metal. 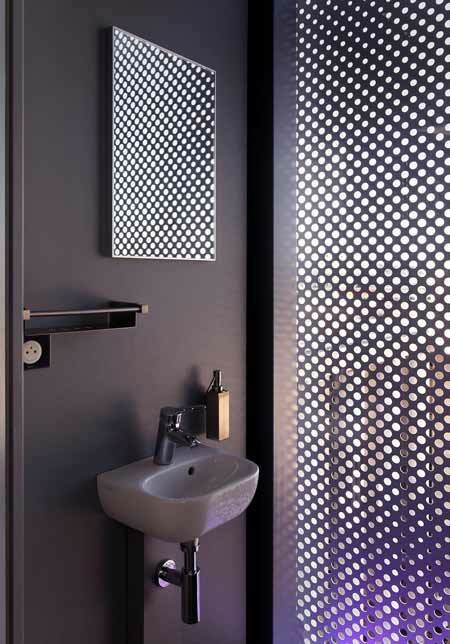 The perforations represent an aurora borealis drawing. The lightning system is put between the glass and the metallic skins. 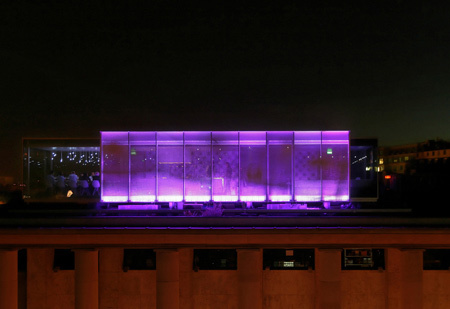 Composed by lines of leds, it emphasizes the drawing of the facade and changes its colors, like a real aurora borealis. 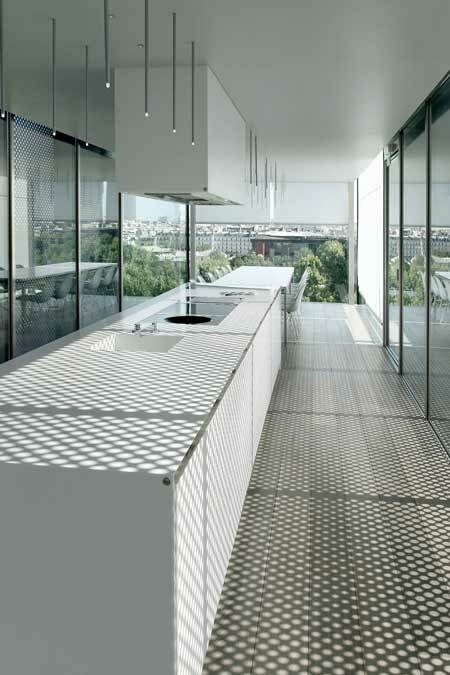 The interior design is minimalist, with a white Corian furniture and a grey wooden floor. 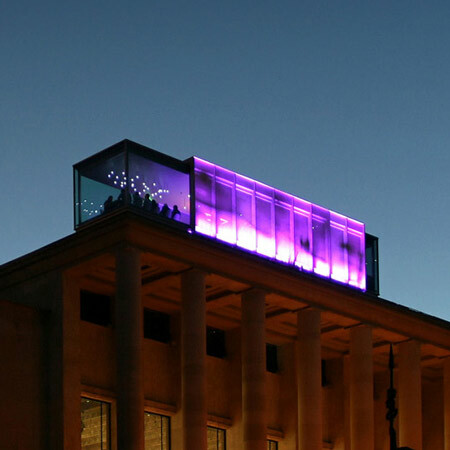 Above the dinner table, suspended leds extend the sparkling of the city.